The White House is selling golden Easter eggs on their website, but don't be so quick to judge. This year, the White House is selling golden Easter eggs to commemorate the annual White House Easter Egg Roll. Given our current President, it seems pretty fitting, right? And at the low price of $14.95, you don't even need a golden goose to get one (although Veruca Salt does remind us of a certain US President). Of course, Twitter immediately blamed the manufacturing of this garish keepsake on Trump's obsession with all things gold. But not so fast! 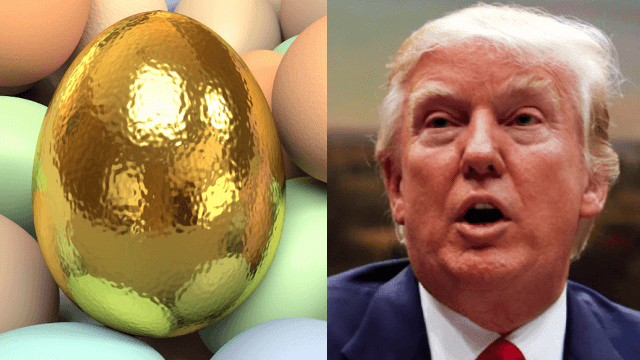 Although this egg is probably as fragile as Trump's ego, he is not the first president to sell the gilded souvenirs. Yep! According to Twitchy, President Obama had his own golden Easter eggs just last year. Seriously, if Trump wanted to leave his mark on this year's Easter Egg Roll, he would have made the egg orange with some Easter grass on top. Plus, the egg isn't actually made of gold. It is comprised of wood and pained gold. Bummer. Still, you have to admit that it does look like something they would serve for breakfast in Trump Tower. Oh well, looks like we will have to just settle for getting mad over things that actually matter!